Following the male-centric tale of mythology and monsters in Hercules, Disney went a different route and created a female heroine for a less fanciful story. Mulan was considered a return to form by many who felt that the company was slipping from its early '90s success. 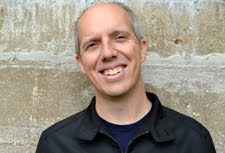 Co-directors Tony Bancroft and Barry Cook (Arthur Christmas) both made their debuts on feature films, and the change shows. There's a much different feeling despite its connection to classics from the past. 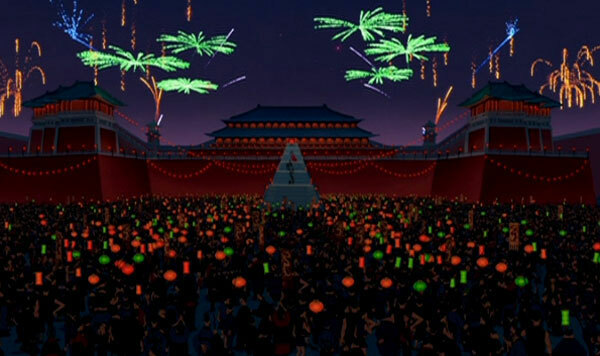 Animators were sent to China for inspiration, and there was plenty of attention to detail put into the four-year production process. This was my first experience checking out this movie despite the fanfare that accompanied the 1998 release. Would it hold up to scrutiny 14 years later given all the technological advances? When the Huns invade China, The Emperor (Pat Morita) sends a conscription notice to male warriors that include the father of Fa Mulan (Ming-Na Wen). She disguises herself as a man to take her father's place and join the army. Her ancestors try to send help in the form a great stone dragon, but the small Mushu arrives instead. 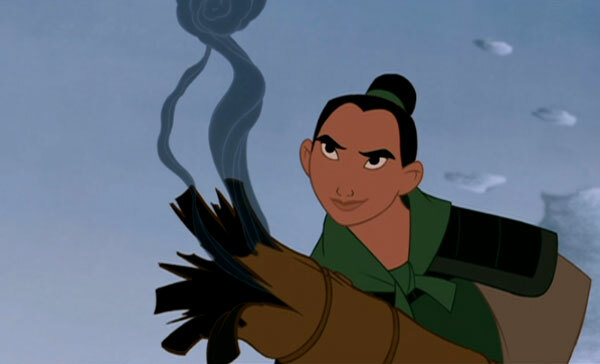 After struggling with her training under Li Shang (BD Wong), Mulan is forced into action when the Huns arrive. Their leader is the vicious Shan Yu (Miguel Ferrer), a massive guy with eyes on the top prize. Mulan and her comrades may have the only chance to stop his impending victory. She must continue to hide her identity or risk facing the ultimate price for her dishonorable actions. Is Mulan on par with the most popular movies from the Disney Renaissance? It falls a bit short of the best films, but it's only a slight drop-off. The story of a young woman inadvertently becoming a national hero is universal, and Mulan is a likable character. Unlike a bland guy like Hercules, we're on her side and are pulling for her to succeed. Ming-Na Wen (Stargate Universe) does great voice work as Mulan and sells her bumbling attempts to protect her dad. There are some truly exciting sequences, especially the key battle where she steps up to stop the Huns. Most of the story lacks the overly comic touches that could drag it down. One exception is Eddie Murphy's part as Mushu, which feels out of place in this setting. I understand that he's the key to connecting with kids who might get antsy. The reason I mention it is because the setting is mostly realistic beyond the small dragon. Another issue is some problematic gender dynamics even with the strong heroine. The obstacles of being a woman make her triumph more difficult, but it also lets the men off the hook. It's not a huge issue but gets a bit shaky when even the good guys are confirming the stereotypes of that society. When Li Shang discovers Mulan's secret, he doesn't kill her but still leaves her stranded in the wilderness. That falls a bit short of the type of forward thinking we might hope for in a modern film. How is the animation? Has it lost any of its luster today? One of the strongest parts of Mulan is the animation, which has the timeless aura of the best Disney movies. It seamlessly weaves in the computer-generated effects with the hand-drawn animation. The color and artistry are remarkable and stand out even more when compared to the dated look from Hercules. It may not have the same appearance as today's three-dimensional movies, but I actually think it feels more lively than many of those releases. The scenes of massive crowds are surprisingly effective and don't seem like digital creations. This is where the animators shine and give a unique style to the entire movie. The close-up moments fall a bit short of this beauty, but it's still effective. Do the songs deserve a place with the best Disney songs of that time period? If there's any specific element that places this movie below a beloved Disney release like Beauty and the Beast or Aladdin, it's the songs. First of all, they appear so infrequently that it's almost jarring when the characters start singing. The Oscar-nominated score from Jerry Goldsmith is well-done, yet something is slightly off about the vocal tunes from Matthew Wilder and David Zippel. They're decent songs but aren't memorable enough to stick with you much beyond the ending credits. The soundtrack is notable for an early appearance of Christina Aguilera doing the pop version of "Reflection" before she hit it big. Seeing just how young she is in the video included with the DVD is pretty surprising. My three-and-a-half year old daughter Elise watched this movie. What did she think? Unlike our experience last week, Elise stayed attentive for most of the 90-minute running time. She still wasn't blown away by it, though. 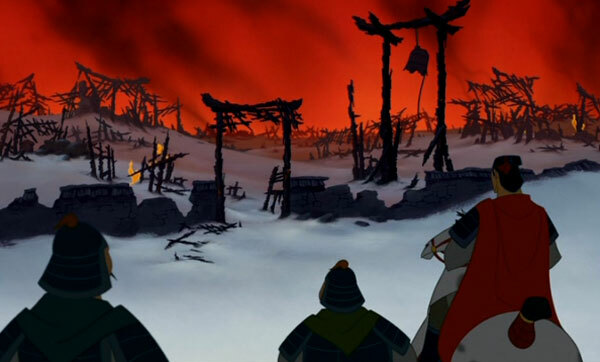 The battle scenes are bloodless yet surprising for a Disney animated film. She had little interest during those sequences, which is okay with me. 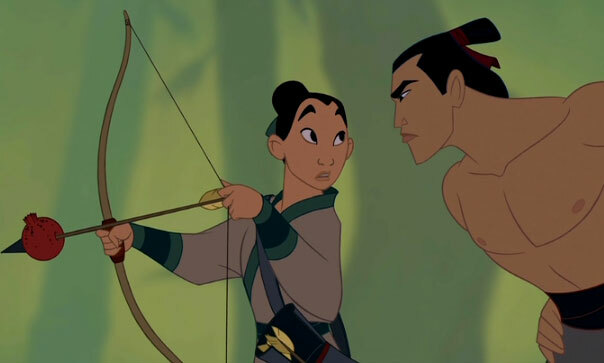 Mulan wasn't a new character for Elise, yet she kept confusing her with Pocahontas. She hadn't seen either movie prior to this point, so the misunderstanding makes sense. When presented a ratings scale of "great", "good", or "okay", Elise chose the lowest grade. However, she did emphatically state that it was better than Hercules. Has Disney made good use of this film in its theme parks? While it doesn't have its own attraction, Mulan remains a staple of Disney parks around the world. This trend isn't surprising given her status as a role model for young girls who have less interest in the standard princesses. Character greetings are pretty common, and she even gets a spot with the strange appearances in It's a Small World in Disneyland. Footage from this movie also appear in the Fantasmic stage show, which projects images on a bubble floating above the audience. She's also perfectly suited to the China pavilion in EPCOT and appeared there for a while, but that's not a common practice now. Next week, I'll close out this marathon and rock out to Phil Collins in Tarzan. Glad you liked this one, though I disagree about the songs. The "Be a Man" number is one of the catchiest things in any Disney movie ever. Joel, I was surprised by how little I can remember even a week later about the songs from Mulan. I'll have to go back and listen to "Be a Man" again soon. I did enjoy the movie a lot on the whole. I'm always impressed when they take something that you can't find in a Grimm's fairy tales and make it into a successful movie (and this was one of my favorite modern Disney classics). Good point, Alan. All three of the movies from this marathon (Hercules, Mulan, and Tarzan) are shifting away from the fairy tales. This one is the most unconventional of the group for sure. I watched this movie when it first came out and it's definitely one of my favourite Disney movies as an adult, although in retrospect it makes a few attempts to conform to a 'standard' Disney story when it would have been better to do its own thing. I agree with you Mushu's one of them. I seem to recall that when Mulan came out, Eddie Murphy's Mushu was supposed to be following in the footsteps of Robin William's genie. He's funny enough, but you're right in that the mystical element doesn't fit in. Perhaps an attempt to give it a more fairy tale feel? As I understand it, certainly back in the 90s, for each movie they would try to figure out who the cute little sidekicks would be, and that's why we've got Mushu here, but I think they'd have done better restricting themselves to the cricket (the three comic soldiers possibly qualify too). I will agree with Joel above that the I'll Make a Man Out of You song is fantastic, even if the lyrics are rather silly. Actually, the only song I don't like is A Girl Worth Fighting For, but I think the main problem is that the songs don't support the film the way previous Disney attempts have. Maybe because the composer for the score is not the composer for the songs? Certainly having no songs in the second half doesn't help. The lack of balance makes me wonder if they'd have been better getting rid of the songs too. Thinking about it, there's a lot I would cut from this Movie, and that's because the main core of it is so solid. Mulan is definitely one of my favourite Disney heroines, even if she does become a bit too kickass by the end (her rescue of Li Shang seems to require far more strength than she could have). I'm waiting for my own kids to be a little older before they see it, six - eight maybe, because the main story is pitched older than something like Aladdin. Randomly, it's occurred to me that between Mulan, Belle and Merida, there's a trend here for the Disney Heroines to ride implausibly big horses. Wish they reflected that in the Princess toy-line instead of these silly Barbie-style horses I've seen on the shelves. By the way, have you tried showing Elise Lilo and Stitch? I haven't shown my children many of the Disney classics, but with both of them (my son's four and my daughter's 22 months), that's become a huge early favourite - mostly for Lilo, who's a great kid character. Sarah, you make a lot of good points. The main story of Mulan is very well-done, and she's such a great character. The issues don't hurt the movie too much, but they feel awkward because they're trying to drag the movie into a more standard formula. The Li Shang love story is definitely part of that trend. We haven't had Elise watch Lilo and Stitch yet, but I think it would probably be a good one for her. I saw it years ago, and it seems like she'd be the right age for it. I agree that Mulan is going to be more interesting for older kids. Elise really likes Beauty and the Beast and Tangled, and has been less interested in some of the other classics. She's also obsessed with The Muppets. It's hard to predict what will really get her hooked. I wasn't sure what to expect with these, but it was fun to see how she responded. Thanks!